Population of the Evergreen State has grown about 60% faster than the national average in first half of the decade. Only seven states have grown at a faster rate; only two of those seven have more population than Washington. International migration — people moving from other countries — accounts for a higher than average share of Washington’s population growth in recent years. International migrants arrived in Washington at the rate of roughly 3.5 per 1,000 of population each year during the 5.25 years from Census Day 2010 to July 1, 2015, the date of the latest state-level Census Bureau estimates. Pulling people in from other states and other countries is a more important factor in Washington’s population growth than what demographers call “natural increase” — the excess of births over deaths. Since Census Day, for every hundred in natural increase, Washington added about 132 via net migration. Washington ranks 15th among the states in terms of its natural increase in population, about five new residents each year per 1,000 of population. The rate is about 18% higher than the U.S. average. Washington’s population grew by just under 446,000 (6.6%) in the 5.25 years from Census Day 2010 to July 1, 2015, the point date for the latest estimates. We calculate an annual compound growth rate for Washington of 1.23% (Table 2), or not quite 60% faster than the national average annual rate of 0.77%. As Table 2 shows, the Pacific Northwest remains a magnet. Idaho and Oregon are growing significantly faster than the national average. Montana is about average. Idaho ranked No. 10 among the states in growth of total population since the 2010 census, Oregon No. 16, Montana No. 19. Population growth can be both cause and effect of economic growth. Washington’s population growth is driven in particular by Amazon.com’s hiring and building booms. As well, most major Silicon Valley technology companies have set up outposts in the Seattle metro area, in part to poach talent from Microsoft and Amazon. To natives, costs seem high in Seattle for people, office space, housing and mobility. But they are a whole lot less than in Mountain View or Palo Alto. The Golden State, home to one in eight Americans, continues to grow faster than average. Two of three components stand out. 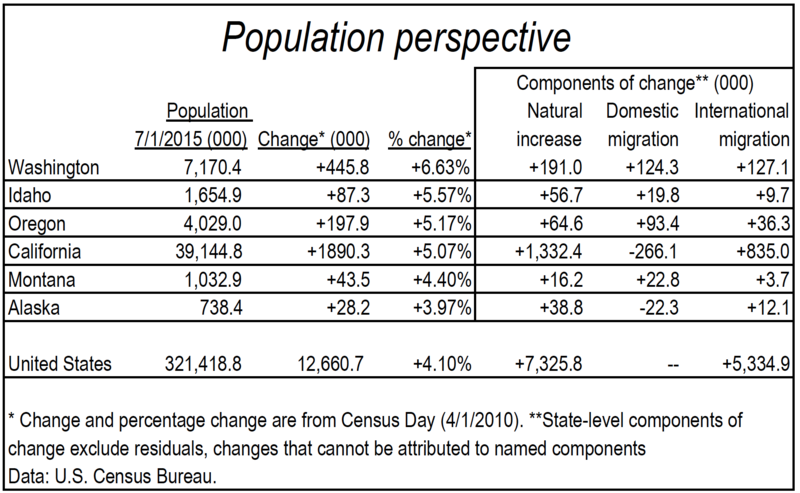 The natural increase in California’s population runs 51% higher than the national average, putting it No. 5 among states, after Utah, Alaska, Texas and Idaho. And like Washington, California is a honey pot for international migrants. It ranks No. 9 among the states on this metric, with about 4.2 net international migrants per thousand annually. But as has been true for years, U.S. citizens are bidding California “adios.” In a little over half a decade, about 266,000 more citizens moved out than in. In that respect, tiny Alaska resembles California. Alaskans are checking out at a faster rate — roughly 6.4 per thousand per year — than in all states but New York and Illinois.